A couple months back I posted my analysis of a Coursesmart survey. This digital textbook provider had polled US college students and reported on how they used their mobile devices. My interpretation was that a significantly higher percentage were using digital textbooks than buying them, and this met with some resistance. Today I got the results from another survey, and it looks like I was right. 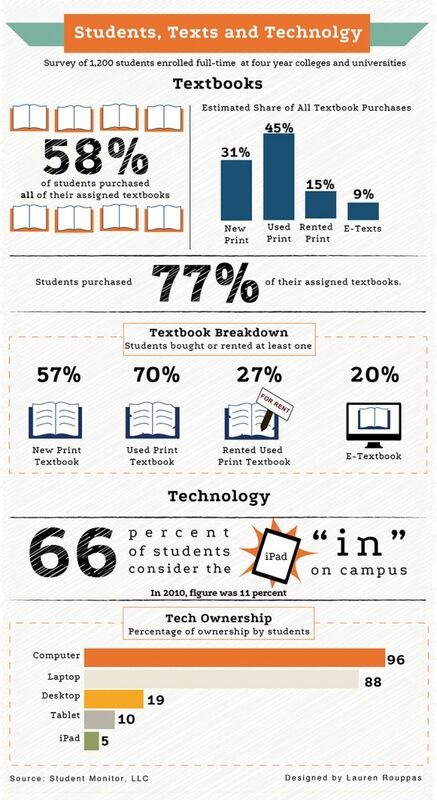 Student Monitor, a market research firm, polled 1200 students in the US on how they buy textbooks. You can find the nearly complete results in the infographic at the bottom of the post, but the short answer was that used textbooks were the primary source, with students estimating that they spent 45% of their textbook budget. New textbooks came in 2nd (31%), with rented (15%) and digital textbooks (9%) coming in 3rd and 4th. The survey also showed that students only bought about 3/4 of the required textbooks, with only 58% of students buying all the required textbooks. The survey also showed that only 20% of respondents had bought a digital textbook in the past year. That's a telling detail which, when combined with Coursesmart's 2 month old survey, tells me that far more people use digital textbooks than buy them. Coursesmart 's survey showed that 43% of students used digital textbooks (but it didn't get into how many were buying them). I said before that far more students were using digital textbooks than buying them, and it looks like I was right. I had also argued in that older post that cross-platform content was important due to the fact that few respondents owned an iPad or tablet. Today's survey results don't quite line up with the older results but they do show students are far more likely to own a laptop than a tablet. Hi Nate, this is really interesting! Can you post the link to the Student Monitor survey? I would love to read more about it. I just have the infographic.